Project obstacles and solutions: TK Hog Farms in Winchester, Indiana is a major pork producer in eastern Indiana. They were expanding their operations to include two new breeding barns that would accommodate 5,000 sows and their litters. Bellar Construction specializes in pork producing barns and was hired as the contractor for this project. Two pumps were used to deliver concrete for the long slab floors. 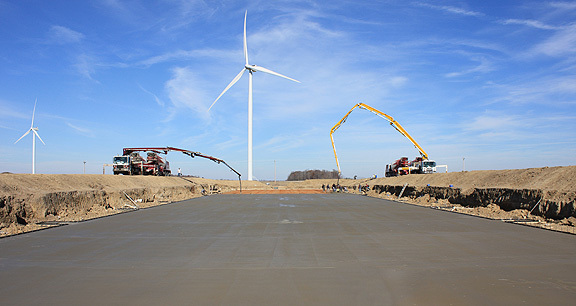 IMI supplied two trucks per pump, pouring continuously until each slab was completed. This required 22 mixer trucks running concrete from the Cambridge City plant 30 miles from the job site, the Muncie plant 25 miles from the site, and the Mount Summit plant 29 miles from the site. IMI plant personnel spaced the trucks so that the pumps were supplied with concrete continuously throughout the pour. They also made sure the trucks were not arriving too soon, so the concrete was fresh and workable when it came out of their chutes. It was very important that the large slab floors be flat and level. The mix used on this project was designed with a blend of large and small coarse aggregates to control curling. A mid range water reducer was used to eliminate excess bleed water and control plastic shrinkage. IMI QC/QA also used a rheology modifier in the mix. This aided the flow of concrete in the pump without losing any of the slump. It also kept the aggregates from segregating during pumping. IMI supplied 2,600 yards of concrete for the two barns. This included the floors, pillars and walls of the two structures. For more information on eliminating curling and plastic shrinkage problems on large slabs, or for information on concrete mixes delivered via pump, contact the sales representative for the concrete plant nearest your location. Click here.